The 3D-TV fad seems to be fading -- and giant, cinema-style 4K sets are the newest cutting-edge tech marvels destined for your living room. A truckload of new TVs, with screen resolutions four times greater than so-called full HD screens, are being unveiled at this week's IFA technology show in Berlin. The screens -- referred to as 4K or ultradefinition -- were among dozens of new gadgets on display for the 250,000 people who descended on Berlin's conference halls. The show features gear ranging from big-screen smartphones to self-stirring cookware, but the big buzz this year is about 4K. The first sets should be available for preorder this fall. There were still plenty of 3D screens, including a 103-inch Panasonic set that doesn't require viewers to wear 3D glasses. The excitement over them, however, seems to be dying down. The new 4K sets from LG, Panasonic, Sony, Samsung, and Toshiba show a level of detail you'd expect on a movie screen; their resolution equals that of professional cinema cameras, like the Red One. The detail is stunning, and viewers can comfortably sit close to the screen. Even from only a few inches away, it's impossible to discern a single pixel. Sony claims that chips in its flagship set can scour normal Blu-ray films and display extra details, producing pictures far sharper than what normal sets can offer. In demonstrations, films looked stunning on the new screens. Not to be outdone, Panasonic teamed up with Japanese broadcaster NHK to create an 8K set -- with resolution four times greater than its rivals' and 16 times greater than Full HD. There is just one problem, of course: storage. There is no media suitable for storing 4K films just yet. Normal Blu-ray discs aren't designed for the new format. In Berlin, most tech companies demonstrated their sets with slow-motion landscape videos. Another new screen technology – OLED, or ‘organic light-emitting diode” -- made a splash at the IFA tech show. The ultrathin sets produce a much crisper, brighter image than a typical HDTV. The technology has become standard in smartphones like the Samsung Galaxy S3, but it's only starting to make its way to bigger screens. Unlike conventional TVs, this one has no backlight. The pixels themselves light up, allowing for deeper blacks and sharper contrasts. 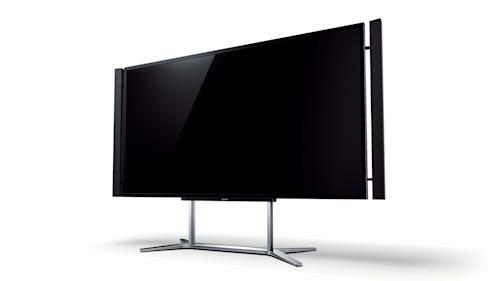 At IFA, Samsung introduced a 55-inch TV, the world's biggest OLED set. Samsung showed off other TV tricks, as well. One lets two people watch two different shows at the same time. The images for one show alternate with the images for the other at an extremely high speed. Each person wears 3D glasses that have tiny shutters inside that flicker in time with their show's images. Samsung's new models also have motion controls, courtesy of a tiny camera that catches movement. Viewers can control the TV's volume and even play video games by simply moving their hands. The IFA also showcased gadgets that let people control smart appliances from a tablet. Panasonic's new refrigerators, air conditioners, washers, and dryers will all be app-controlled. Users can switch them on and off from anywhere, and monitor their usage for peace of mind. Samsung unveiled apps for its Galaxy tablet to control dishwashers, air conditioners, and other appliances. Philips brought out celebrity chef Jamie Oliver to demonstrate its vision of "Jetsons"-style kitchenware: a high-tech pot that chops, stirs, and heats food on its own. The Home Cooker is a computer-controlled food processor and pot all in one. The device can stir risotto and even cook a curry in the base of the unit while steaming rice above it. The IFA was also packed with computers, and there was a lot of buzz around a laptop-tablet hybrid that runs Windows 8. The slim, light gadget is essentially a touch-screen tablet with a keyboard that snaps or slides into place. Dell's XPS Duo machine looks particularly glamorous, with a superslim Ultrabook body that swivels out to become a tablet. HP and Toshiba also unveiled dual-purpose machines. Hundreds of companies will show off their wares tomorrow at IFA, with gadgets ranging from the lustworthy (new high-end Sennheiser headphones) to the slightly ridiculous (dancing robots from Vietnam's Tosy Robotics). The best of the bunch may end up in your living room not too far down the road.